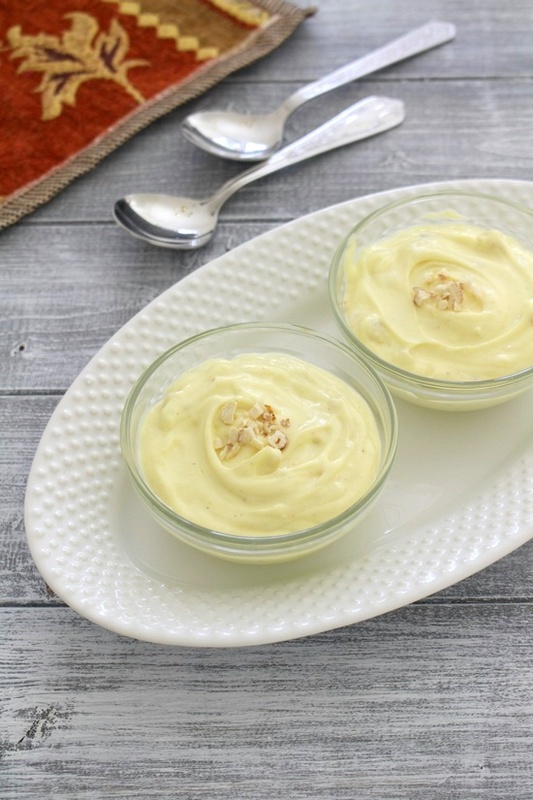 Shrikhand recipe – This is the traditional sweet from Gujarat and Maharashtra. It is also known as ‘Matho’. It is made from hung or strained curd/yogurt and sugar. Chopped nuts are also added. Here I have made small quantity enough for 2 people (me and hubby), but you can make double or triple the recipe, as per your need. Here I have flavored it with saffron and green cardamom powder. So it is also called kesar elaichi shrikhand. 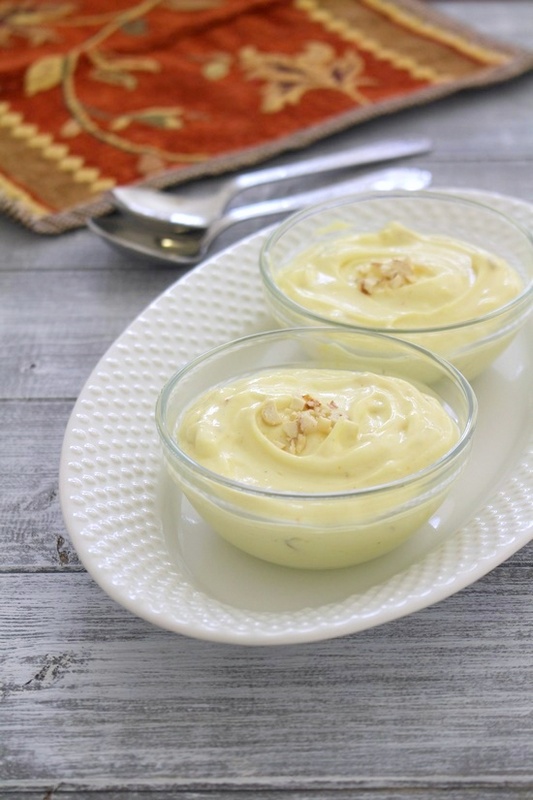 Shrikhand has thick, creamy, smooth consistency. It is rich and sweet. Per person you will need a very small bowlful (small katori) of quantity. For making shrikhand recipe, we need to strain all the liquid aka whey from the yogurt. It will end with thick yogurt which is known as hung curd or chakka dahi. This straining process will take at least 4-5 hours. If you are in rush, you can use greek yogurt instead. I have shared both recipes below. When I first published this recipe, it was made with greek yogurt only. That time, a container of greek yogurt was sitting in my fridge and I had no idea how I can finish it up quickly. 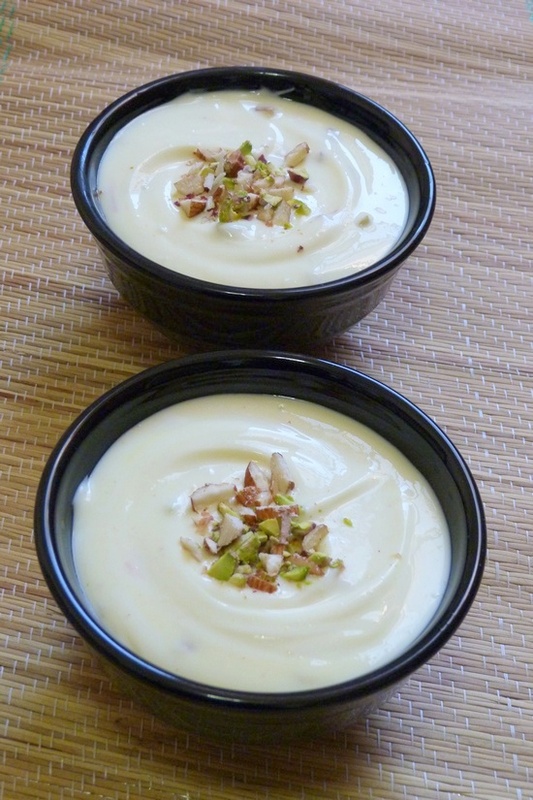 Then some of my facebook fans have suggested to make shrikhand using greek yogurt. That time Diwali was around the corner and I made this yummy sweet within 15 minutes only. Thanks to my dear readers who gave me this brilliant idea. Now after this long, some of the readers have asked me how to make it using plain yogurt. So here I am updating this post and sharing the recipe. Recently I made mango flavored too. I will be sharing that soon. 1) First let’s prepare for hung curd. Take a deep bowl and a strainer. Select the bowl or mug which is deep, so the strainer is not touching the collected liquid in the bowl. 2) Put the muslin cloth or man’s handkerchief or clean, pure cotton cloth over the strainer. 3) Add plain yogurt into the prepared strainer. 4) Gather the cloth edges and if you squeeze it lightly, you will notice the whey/liquid is dripping. 5) Tie the edges of the cloth. 6) We have just prepared it and you will see that the liquid is already collecting in the bowl. Now keep this whole thing into the refrigerator for at least 4-5 hours. You can keep it overnight too. 7) After 5 hours, all the liquid/whey has been drained out. You will left with very thick yogurt aka hung curd or chakka. 8) You can use this collected whey for kneading the chapati dough or add in the dal/curry/soup. 9) Now crush the saffron in mortar and pestle. Also warm up the milk in microwave for few seconds. 10) Add crushed saffron into the warm milk and stir. Since the milk was warm, saffron will infuse its color immediately. 11) Take hung curd into a bowl. 12) Add powdered sugar. We are grinding the sugar into powder form and then using in the recipe. So it will dissolve quickly. 13) Also add saffron milk. 14) Stir it well using spoon till everything is incorporated well. Make sure there are no lumps. Do not whisk or stir vigorously otherwise you will end up with runny and thin consistency of shrikhand. We want nice and thick. 15) Now add cardamom powder, chopped nuts. 16) Stir well to combine. Shrikhand is ready to serve. If not serving right away then keep it chilled into the refrigerator. After some time, saffron will infuse its flavor more and more. So I would suggest to make it ahead of time and keep refrigerated till the time of serving. If making in larger quantity then it may be little tough or hard to combine thick yogurt and sugar. If so, follow this my grandmom’s method – Take strainer or sieve, take about ⅓ to ½ cup of thick, strained yogurt along with couple of tablespoons of sugar. Using spoon, keep mixing, mashing and pass this mixture through the strainer or sieve. Repeat the same with rest of the yogurt and sugar. This way everything will get combined well without ruining the consistency of shrikhand. 1) First dissolve the crushed saffron into the warm milk. 2) Saffron will infuse its flavor and color right away. Keep it aside. 3) Take greek yogurt in a bowl. 5) Stir well till sugar and yogurt is combined well. Do not stir it vigorously otherwise the consistency will get runny and not thick. 6) Now add saffron milk, cardamom powder and chopped nuts. 7) Mix well. Chill it into the fridge for couple of hours before serving. 8) Remove it to an individual serving bowl, garnish with chopped nuts and serve. This makes 2 servings, but you can double or triple the recipe, you will get same results. Serving suggestions: Shrikhand is usually served as a sweet dish along with feast meal thali (thali may include potato sabji, puri, dal, rice, farsaan, pickle, papad). So a piece of puri is dipped into the shrikhand and eaten. Shrikhand-poori is the best combo. Though, it can be served alone as a dessert after meal. I am sharing two method of making shrikhand recipe. The one is traditional method where hung curd is used. 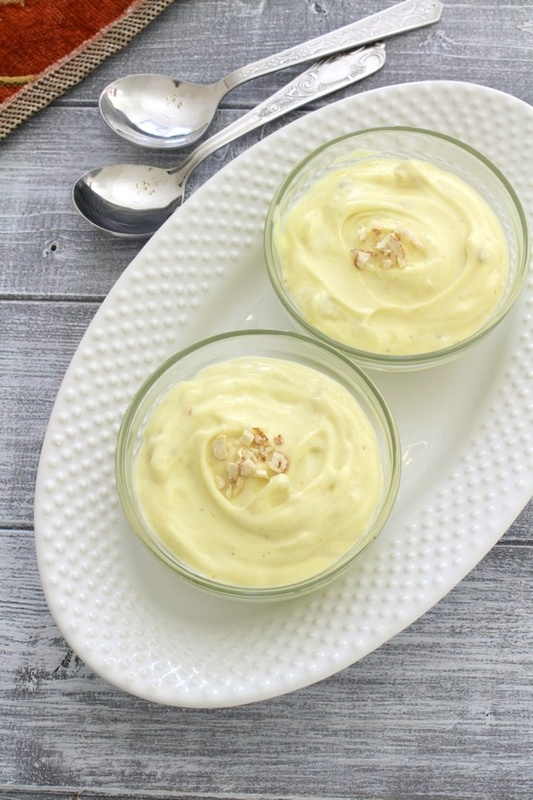 Second is instant version where shrikhand is made using greek yogurt. After 5 hours, all the liquid/whey has been drained out. You will left with very thick yogurt aka hung curd or chakka. Also warm up the milk in microwave for few seconds. First dissolve the crushed saffron into the warm milk. Take greek yogurt in a bowl. Add powdered sugar. Now add saffron milk, cardamom powder and chopped nuts. Mix well. Chill it into the fridge for couple of hours before serving. a rough Nutrition information for 1 serving (made from greek yogurt) is 112 kcal. *below Nutrition information is a rough estimate for 1 serving (made using fresh yogurt). Thank you for your recipe using Greek yoghurt. Very happy to read the comment like this. 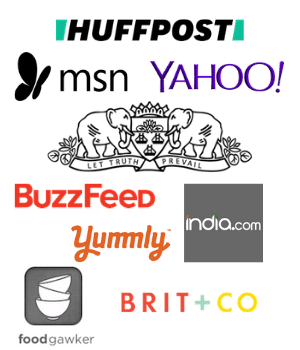 Thank you, Neeta for trying the recipes and writing back. Shrikhand is Maharashtra sweet dish.